While building fence I noticed a lot of hog damage on the neighbors side. I wanted to ride fence and check all of our perimeter. Everything looks good except we didn't ride to closely to the north fence line. There is a pair of emus that patrol on that neighbors side. Pizza is out of oven. Sorry about being scarce around here. Thanks again for the concern. It really is nice to know someone misses one when not around. Between myself, two friends and George's brother (I think) this was cleared. It took all of us a few weeks to do. 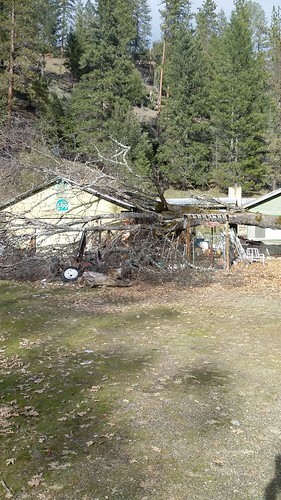 There were also a dozen or so trees down on the driveway. Thankfully only the one Oak though. They're rough on the saw chains. Pines, no problem. Only some of them were really big trees. Anyway, we can get in and the Shop didn't suffer any really serious damage, thank God. There were also trees down here in Oak Run. Branches of oaks all over the place. A few of the smaller Digger pines dropped over. The neighbor's driveway was a real mess. I went over and helped her clean it up. Jmebear put shock tape around the Front Yard today. She doesn't want to mow it. LOL, I can't blame her a bit! Old Breezy should really like the job. She's rough as a corn cob, however I believe she's fixable. It's just a matter of working at her. 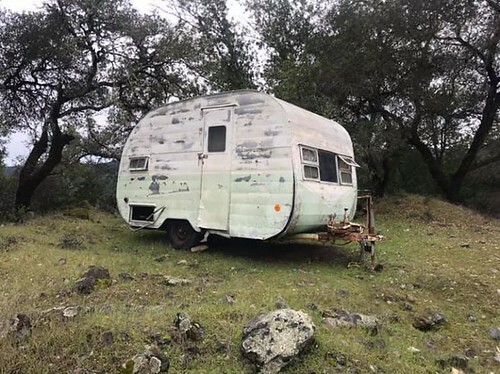 The lady who currently owns the trailer bought it new in 1954. I'll likely go through a whole roll of Gorilla Tape getting the poor old thing ready for the road. Well, time for bed. I hope everyone around here sleeps well and has a great Friday. I also hope all of our members, both participants and Lurkers are not dealing with all that horrible flooding!